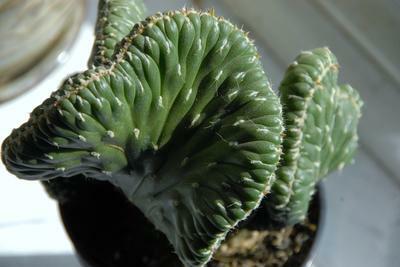 I think this is called a brain cactus, but I am not sure! It could be a succulent. My mom bought this at home depot, and I think he is absolutely adorable, and was wondering about how to care for it properly? Hi Taby, this technically is not a cactus, but it is a succulent plant. 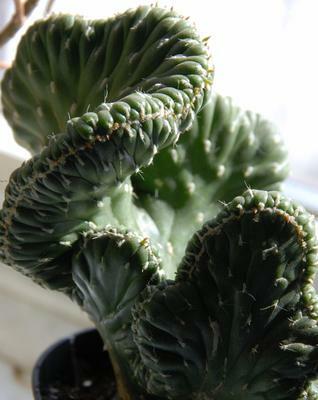 This is one of the Euphorbias, which are quite poisonous. If you have small creatures wandering around, please be careful with allowing them contact with it, and if you're pruning it, be aware that the sap is caustic and can cause burns and contact dermatitis. I don't know why they sell these without putting warnings about their toxicity on them, but there you have it; my rant about box stores selling plants over now. Botanically, this plant is known as Euphorbia flanaganii, which you can see more about on Dave's Garden Website. Comments for Brain Cactus Care? Cathi, that would maybe be a flower stalk emerging. Sometimes they look completely different. Alternately, if it's a grafted plant, the root stock sometimes starts to take over, and eventually the grafted part dies out. You do not want this to happen! Maybe post a picture of your plant on the Ask the Horticulturist page. My Brain cactus is now huge and has a weird huge branch with waxy leaves growing out of it! 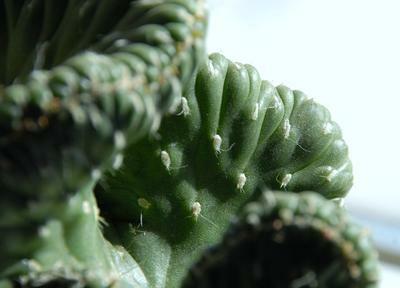 So, the one you're referring to is actually Austrocylindropuntia cylindrica f. cristata and is different from Euphorbia flanaganii - they're similar, but yours is definitely the Euphorbia. Wow, thank you very much for letting me know!